This spacious 5,000 square foot, 7 bedroom, 6 bathroom deluxe-rated two-story home can sleep up to 18 people. It's located near the Aspen Golf Course just off Cemetery Lane in Aspen's West End. This house provides incredible views of Pyramid Peak, Aspen Highlands, and the Buttermilk/Tiehack ski areas through large picture windows. It is located in a quiet neighborhood setting but close to a free shuttle stop that will bring you into Aspen’s downtown core and the world-class shopping, dining, and skiing that Aspen offers just minutes away. Guests have exclusive access to this home’s two car garage and large driveway, which can handle up to five vehicles. The upper level has 4 of the 7 bedrooms (king bed, king (can be made into two twins), king (two twins), and two twins separated). It also has a double living room, a dining room with seating for 10, a wood-burning fireplace, hardwood floors, a Bose sound dock, multiple DVD players, DVR, a bonus bedroom with a twin bed, and a laundry room. A large outdoor patio deck is complemented by a gas grill and a hot tub. The kitchen includes granite countertops, two ovens, a microwave, a Jenn-air cook top, and a dishwasher. 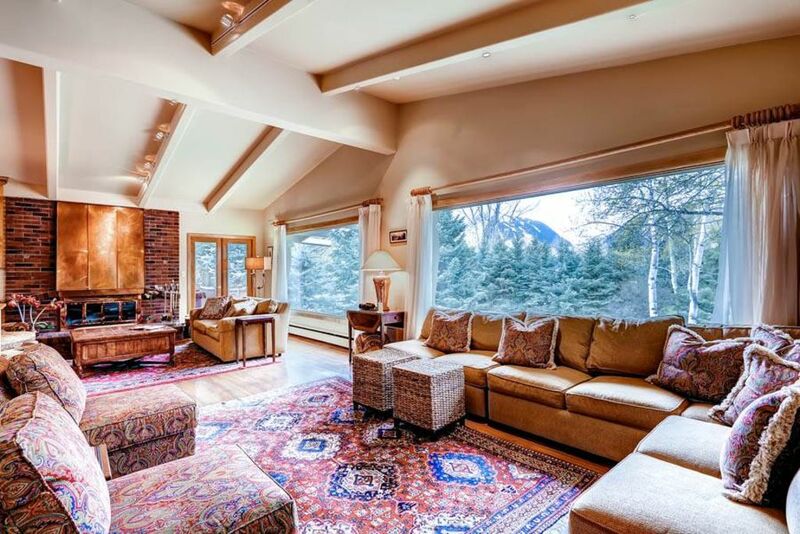 It's fully equipped and ready for you to entertain while in Aspen! The first floor has the other three bedrooms (queen, two twins (king), and king (two twins)), a nice living room with fireplace, hardwood floors, a large flat screen TV, another full kitchen, a dining area with seating for 8, and a washer/dryer. It is perfect for allowing a second family or the kids to have their own space. Daily housekeeping is included with your rental – the house’s private housekeeper who will clean and make your beds each day. Call us, and allow McCartney Property Management’s guest services to open the door to your Aspen experience! This is one of the best places the stay in aspen. To get to Snowmass via Bus you have to take a very short walk to the bus stop at the end of the street then transfer at 8th street to the bus that takes you to Snowmass, it is very easy. The house is full of great books and has plenty of space to spread out and relax after a day on the Mountain. Also, there are 3 coffee makers, two standard and a Keurig for those of you who love coffee. When we left the house on Sunday we ran into the new tenants and they mentioned that they come to this house every year in the summer and winter. I think that says a lot about how awesome this place is. I can't wait to go back. The house seemed to be endless. The perfect blend of being part of a big group within common areas while being able to step aside in to a more personal common area to reflect on one's own thoughts and experience. The view out the front panoramic window was amazing. The closeness to a main bus line made coming and going easy. I liked the fact that I felt comfortable everywhere in the house best. There were a few difficulties with the Internet connectivity, but they were quickly resolved.